In 2004, the original Spider Pen became a classic magical instrument. Due to the worldwide popularity, Yigal Mesika has honed the original concept to once again reinvent the reel. 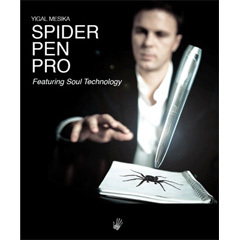 The Spider Pen Pro is nothing short of a revolutionary electronic device because it is the first to feature patented Soul Technology. This break through technology allows you to take your mind off of the method and lets you focus on your magic, giving you the undeniable edge for mastering levitations and animations. From the leading brand in the art of levitations comes the new gold standard in IT reels. When you put your hands on the state of the art engineering in the Spider Pen Pro, your levitations and animations will look like Hollywood's special effects. Nothing else comes close. • No springs or rubber bands - Lets you pull As Much I.T. As You Need!